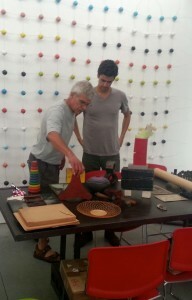 Gallery owner Corey Daniels and director/artist Miles Spadone confer on a project. The two sit down with Martin Willis for this week’s Antiques Auction Forum podcast. In this week’s Antiques Auction Forum podcast, Martin Willis stops along busy U.S.-1 in Wells, Maine, and has a conversation with gallery owner Corey Daniels and gallery director/artist, Miles Spadone. Cory discusses his transitions from 18th-century period furniture to today’s contemporary art, which he displays in a beautiful setting. Check out the Corey Daniels Gallery website and Facebook page.